rticles in the Virginia Law Weekly offer readers the scoop on a microcosmic community: that of a law student. Accumulated over 70 years, they create a powerful narrative of academic and social life. The hours required are “whatever it takes” — and in terms of career prospects, some might argue, better spent on an academic journal. The promise of a byline and the satisfac­tion of a well-told story are often the only guarantees of reward. She is just one of countless student journos over the past seven decades who have heeded the call. The award-winning Law Weekly has captured some of the most important moments in the Law School’s history, debated the issues of the times and, occasionally, made news of its own. Always, it has done so with its own unique style and humor. Students protested and petitioned to change South Africa's policy of apartheid in 1985. The first issue of the Virginia Law Weekly was published May 27, 1948. The reported circulation of 4,700 included alumni and others in the legal profession, in addition to members of the Law School community and local readers. A front-page article headlined “Birthday …” introduced the Law Weekly and stated its aim to be a forum for the community that would further the best interests of the Law School. To this day, Jefferson’s portrait graces the front page. The newspaper would commence regular weekly publication the following September. Starting that fall, in a tradition that would continue until the 1970s, Law Weekly staff held an annual banquet as a send-off for graduates. U.S. Supreme Court Justice Felix Frankfurter was the featured speaker and discussed challenges the justices faced, such as managing demanding workloads and tackling lawyers’ ill-prepared oral arguments. In 1956, the Law Weekly won its first American Bar Association newspaper of the year award. The Law Weekly’s prestige only grew. For example, all three candidates for the presidency in 1968 submitted pieces written exclusively for the Law Weekly asking for the student vote. Of Richard Nixon, Hubert Humphrey and George Wallace, Humphrey came out on top in a student preference poll. Bill Hackworth ’73 served as editor-in-chief for the 1972-73 academic year, which kicked off with the staff taking home a 16th consecutive ABA first-place award for student newspapers. At that time, reporters banged out articles on typewriters. Edited articles would have been hot-waxed to paste-up pages, each piece neatly hemmed in by border tape. 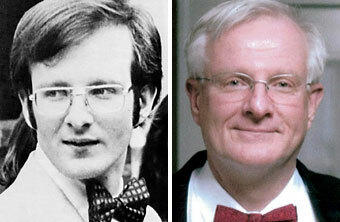 It was a transformative time. 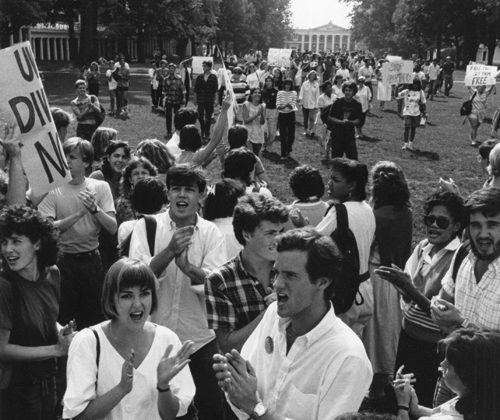 The Viet­nam War was ending, and at the University, students were seeking social change. Hack­worth took Evidence with Larry Gibson, the first black UVA Law professor. The Law School was contemplating its move to North Grounds. By that time, the Law Weekly was housed in a trailer adjacent to Clark Hall. It boasted a staff of 45 students, including business and advertising staff, and more than 2,500 subscribers. “I suspect that the mix of serious mate­rial, such as the ‘DICTA’ column, along with informative articles about Law School orga­nizations and activities, a good bit of humor, a clean layout and professional printing made the VLW stand out,” Hackworth said. He would go on to become a trial attorney for the U.S. Department of Justice and, later, city attorney for Roanoke, Virginia, before retiring in 2011. The staff members were talented, but few had newspaper experience. “We relied heavily on what those at Mr. Jefferson’s University so often do — tradi­tion — and followed the same basic format devised over the previous 25 years,” he said. Hackworth attributed some of the Law Weekly’s success to a rapport with the Stu­dent Legal Forum, which during his years recruited notable speakers to lecture at the Law School, including Vice President Spiro Agnew, Sen. Edward M. Kennedy ’59, U.S. Supreme Court Justice Thurgood Marshall and former Chief Justice Earl Warren. “Our reporters were able to perform side-by-side with the national media when they covered these speakers,” Hackworth said. 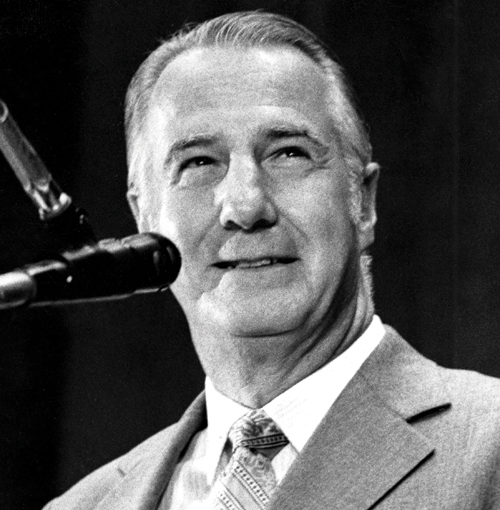 In 1973, the Student Legal Forum hosted Vice President Sprio Agnew, who resigned in disgrace. 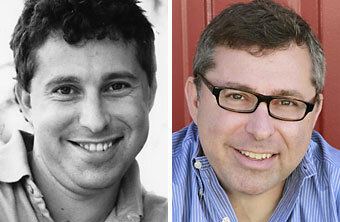 Both Hackworth and Dunmire said much of the appeal of working on the newspaper was camaraderie. Dunmire said the work environment felt like friends working to­ward a common goal, although they rarely gathered as a group, since content trickled in throughout the week. 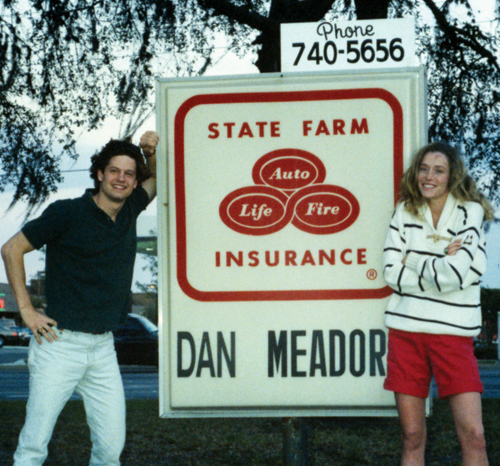 “I had a feeling of accomplishment — for myself and the staff — every Friday as the lobby was filled with students picking up and reading the Law Weekly,” she said. Under her leadership, the weekly won ABA awards for reporting and design. Also during Dunmire’s tenure, Michael Goodman ’80 won the ABA’s 1979 Award for Excellence in Cartooning, in a field of more than 60 entries. At the staff’s final gathering, Goodman presented Dunmire with a cartoon poking fun at her conserva­tive editorial judgment. Dunmire retired in 2013 as deputy general counsel of Commerce Bancshares in Kansas City, Missouri. 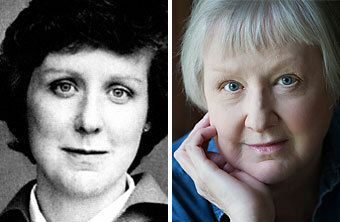 She had worked for two law firms in Kansas City before joining the bank’s corporate legal department in 1984. 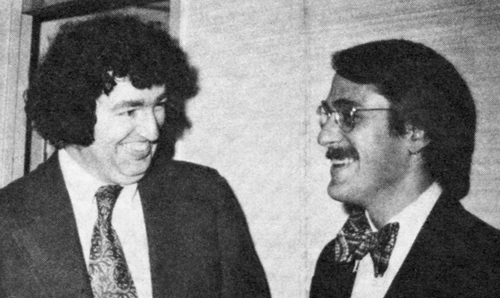 A photo of professors Peter Low and John C. Jeffries Jr. from the DICTA column. Before the internet and today’s myriad sources of news and commentary, the Virginia Law Weekly offered a forum for scholarly discussion. Professors, though at times skewered by the newspapers’ com­mentary, were eager to participate. One DICTA column the Law Weekly pub­lished became legal history when it caught the attention of the U.S. Supreme Court. Virginia Law Weekly front pages from the first issue in 1948, 1960s and '70s. “Constitutionalizing The Criminal Law?,” by professors John C. Jeffries Jr. ’73 and Peter W. Low ’63 was published March 25, 1977, and was cited in Patterson v. New York that June. The professors, who had clerked at the Supreme Court earlier in their careers, had turned to the Law Weekly for an immediate outlet to contribute to the legal conversation. The New York law was a compromise, Low said. It significantly broadened the concept of provocation, which had traditionally reduced murder to manslaughter, in ex­change for putting the burden of proof on the defendant. The question was whether such compromises conflicted with the obligation of the prosecutor to prove the elements of a criminal offense beyond a reasonable doubt. Low retired in 2014 and is now profes­sor emeritus. Jeffries in August became the University’s senior vice president for advancement. Assistant Professor Gail S. Marshall ‘68 after a court appearance as the defense attorney for the Virginia Law Weekly Associates and 15 people named in a defamation suit brought by members of the Charlottesville Police Department. In addition to its many successes, the Law Weekly faced challenges not unfamiliar to its professional counterparts. 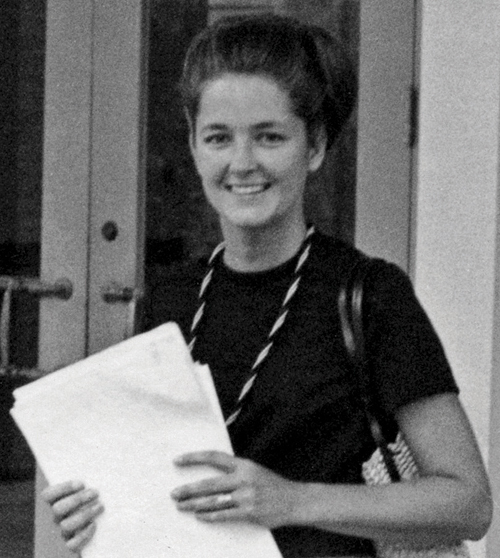 Assistant Professor Gail Marshall ’68, who then taught contracts, torts and legal philosophy at the Law School, served as pro bono counsel for the Law Weekly in 1971 and sought dismissal. After newspaper staff showed up for depositions and the plaintiffs did not, the case was dropped. “Back in the day, depositions were not automatic, so getting the court to order them was, in my view, what caused them to abandon the matter,” she said. Marshall left teaching and later became recognized for her pro bono efforts in the areas of fair housing, the environment and parolee rights. Today, she runs her own law office in Rapidan, Virginia. Although the defamation suit may not have been frivolous on its face, “I think they truly thought they could silence this kind of criticism,” she said. The plaintiffs faced a high bar because as public officials, Marshall explained, the officers would have to prove the newspaper acted with reckless regard, whether the Law Weekly’s accusations were truthful or not. The Law Weekly ran a series of photos that found professors’ names in unlikely places for an April Fools’ Day issue. 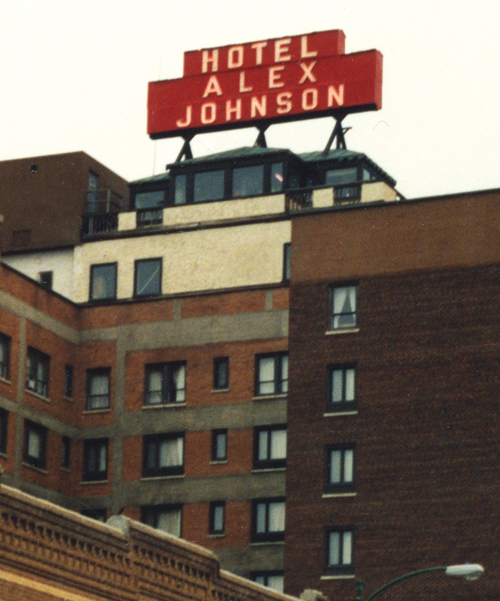 The Hotel Alex Johnson is in Rapid City, South Dakota. Michael Kun ’88 started writing for the student newspaper at Johns Hopkins University as an undergraduate and wrote a humor column, “Ham on Wry,” for most of his time there. As Kun’s column illustrated, though the paper started as a fairly formal institution— “The VLW was always a high-class opera­tion,” Hackworth said—it evolved to include more humor and irreverence over the years. The paper published an annual fall humor edition during his day. An annual Virginia Law Weekly-Virginia Law Review game often concluded with a self-congratulatory article about the Weekly's win. Members of the staff were also gleefully glib in their reporting of recreational sports, including “Mad Bowl” football. Law Weekly and Virginia Law Review staff faced off an­nually at the Madison Bowl, a playing field across from the Fralin Art Museum. 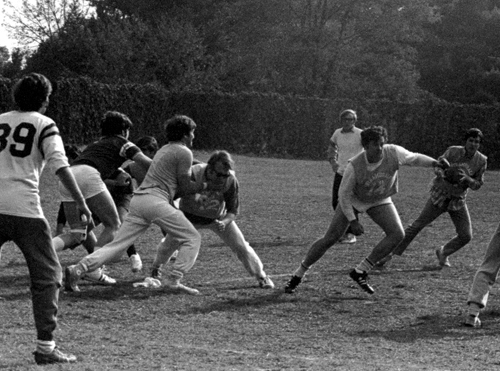 Faculty served as referees, including future U.S. Supreme Court Justice Antonin Scalia for a 38-0 Law Weekly triumph in 1970. Neither team took the games seriously, Hackworth recalled, and coverage was con­spicuously one-sided: “Law Weakly Machine Crushes Revue in Tie Game,” the paper reported in November 1972. The humor would find its way to the new location, Dunmire recalled. For current Editor-in-Chief Jansen VanderMeulen ’19, this year means showcas­ing 70 years of history at the Law School. A historical editor has been finding articles of interest from the past to re-publish. And just like old times, the Law Weekly is coming off yet another ABA law school newspaper of the year award, its second in a row and 28th overall in all categories and placings. “As long as members of the Law School community keep picking up our papers, we’ll keep publishing them,” VanderMeulen said. —Eric Williamson contributed to this report.